We are taught in Zen not to waste food, not to throw it away, not to let it spoil or go bad. that have missed their mark. At the turning of the year, walk on in faith. Eat your life wholeheartedly and above all do not waste it. Just bumped into a chap in the cloister and we had a chat. He was leaving the New Year retreat early. Some might say he had failed because he didn’t make it through to the end. Not so, definitely not so. I’ve just eaten three chocolates, he said holding up three fingers in front of his face. Three chocolates, I just saw them on offer in the common room and took three. He was triumphant. Err? You’ll have to fill me in a bit more on that one. He did. Apparently last time here he could hardly eat anything, it was a real struggle to sit and eat a meal. To actually put food in his mouth. Why’s that then? I asked. Oh, you know. Guilt and all of that stuff. We parted. OK if I email you? Sure. Go to my Jade Mountains web site and you can email me from there. Same goes for anybody who wants to write me. The fourth of the Five Thoughts is: we will eat lest we become lean and die. Few of us are eating to keep flesh on our bodies so obviously this has levels of meaning just like the preceding three. Our friend above, like so many people, go head to head with life and their troubles when faced with a plate of food. To eat or not. To eat life, or not. Eating ones life, actively connecting with what’s there and eating without picking and choosing is practice. People dying inside for lack of nourishment is a very very sad sight. And so when people come here who struggle with life and who then connect with the practice and eat, well that is cause for joy. Continuing on with the Five Thoughts, the third goes thus: We must protect ourselves from error by excluding greed from our minds. During the retreat a few weeks ago I suggested to one of the guests that he might have a question to ask during one of our public question and answer ‘teas’. Sure enough he did and it gave me an opportunity to make a point which relates very much to the matter of excluding. BTW The Great Matter refers to the question of life and death. Along with the life saving ColdFX capsules from Edmonton (thanks Mike) were a couple of clippings from Canadian Geographic. 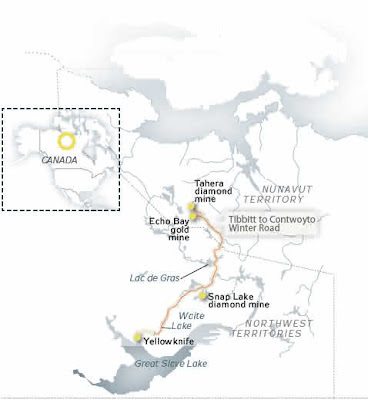 I’d heard Mike tell of the ice roads in the Northwest Territories, and beyond into Nunavut which reaches into the Arctic Circle. Each spring in late January or early February Mike dispatches truck loads of supplies to the diamond and gold mines in the far north. It is a big eye opener to see what is going on in an area of the world we could be forgiven for thinking is uninhabited and uninhabitable. The Tibbitt to Contwoyto Winter Road runs for 360 miles. Driving speed is 22 mph or less, trucks go out in convoys of three at a time, the ice has to be 40 ft thick to take the weight of the largest trucks. There always has to be two up in a truck and apparently drivers wave the seat belt rule to give themselves needed seconds to jump clear of their vehicle if the ice breaks. If I were up in Lac de Gras at -31c I’d have second thoughts about the wisdom of being there. At the start of our feast today we recited the customary meal time verse, the Five Thoughts. The second thought is ‘we must consider our merit when accepting it’. One can understand this in a number of ways, for me it is a right now consideration. Eating a meal is not a life threatening activity however in terms of practice there is ultimately no room for past or future. I guess that must be the same for those truckers out on the ice. Ripples of shock have been passing through the ranks today. Apparently, according to the Food Programme on BBC Radio 4, there are only a handful of companies, possibly just three, in the world that process the raw cocoa bean. Pause a moment for the full impact of this news to sink in. It means that chocolate is being shipped, trucked and generally transported around the world, in bulk. I’m not sure why this is so stunning but it is. It is kind of interesting to think about and study the ways and means by which chocolate comes to us. 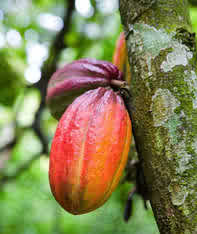 Cocoa cultivation for example is fascinating. When we start a meal we say the ‘Five Thoughts’. The first one is ‘we must think deeply of the ways and means by which this food has come’. No doubt many of us will be eating well during the festive season and generally eat well during the rest of the year too. I see this verse as helping one to pause and appreciate the bigger picture and to help bring forth gratitude.